Manolo says, that one of the Manolo’s many internet friends has asked the Manolo the question. I, like everyone and her sister, am looking for a pair of wedge sandals to wear this spring and summer that won’t make my delicate little feet look like the Queen Mary I & II. I don’t much go for espadrilles; they get so ratty and stinky after the first rainfall. 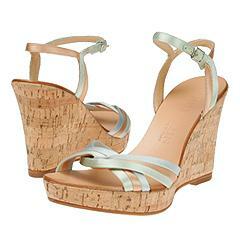 But I do really, really like wedges with cork heels. And I’d be especially excited if you knew of any done up in metallic or beige leather, and positively orgasmic if they also had an ankle strap. Oh, and since these shoes are so trendy, I’d like to stay under $100. Yes, I’m also a picky eater. 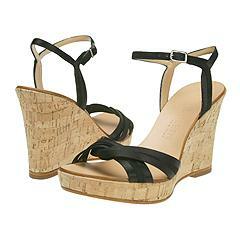 Manolo says, the wedges they are indeed “in” this season. Here are the pair of the wedges from the Anne Klein that are slightly more than $100 American dollars, but are indeed most pleasing to the Manolo. If these they are not to your liking than perhaps you be would more interested in these shoes from the Coach. Manolo says, these shoes from the Coach, they have a charming simplicity that the Manolo finds appealing. This entry was posted on Thursday, March 3rd, 2005 at 5:03 pm by Manolo the Shoeblogger and is filed under Anne Klein, Coach, Shoes, Wedges. You can follow any responses to this entry through the RSS 2.0 feed. Both comments and pings are currently closed. Joey appreciates these classic, nautical wedges.